As we save up a little money over the next month for sunroom repairs (after paying off the foundation leveling), and I continue attempting to organize my office, Keith and I have been discussing focusing on a slightly smaller home project - our two bathrooms. Both bathrooms are currently painted, have a little art in them, and Restoration Hardware-esque shelves we designed in one (guest) but we haven't done much beyond that. This past week my father-in-law was in town so he very nicely offered to install new mirror lights in the master and guest baths that I purchased from the Pottery Barn outlet a few months ago. The majority of our house lights are from the outlet store since I've been slowly replacing them all over time. This last shopping experience though, I made my first outlet lighting mistake - I didn't check the boxes thoroughly enough and the guest light was missing a sconce. Unfortunately they have a no return policy so we currently have a light above that mirror with exposed bulbs (the shame!). Keith is trying to figure out a way to add mason jars as sconces to deal with that issue, and I'll post some photos if we go that route. 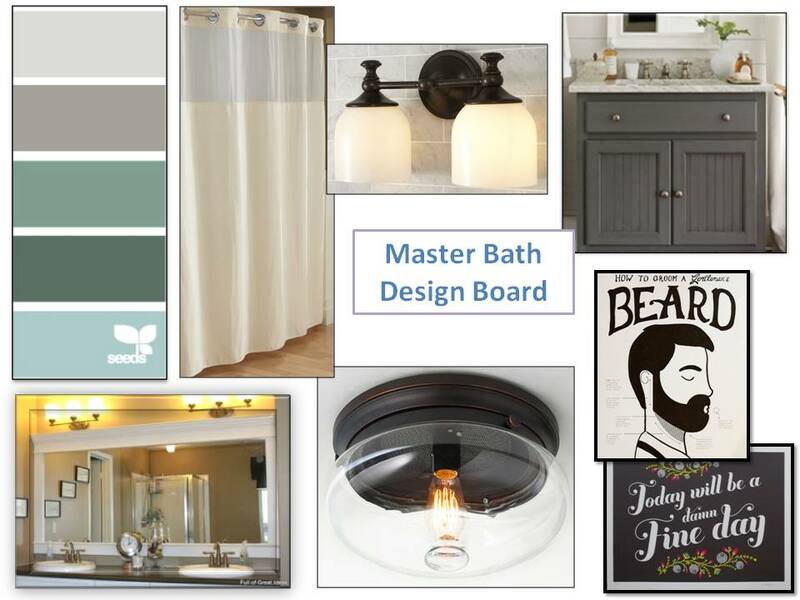 The master bathroom is one of the rooms in our house that I've repainted multiple times and thankfully I'm very happy with the current light green shade, but am interested in doing something different with the ceiling (darker paint, wallpaper, etc). We already have the beard poster shown above and are trying to decide if we have wall space for the damn fine day one too. My father-in-law installed the double sconce lights this week, but next on my DIY list is installing a new (yet to be purchased) ceiling light, framing in the glass mirror over the sinks, and hanging the extra long shower curtain. After the sunroom gets repaired, we plan on bringing in an electrician to install recessed lighting in our kitchen and one in each shower too. I also have crazy dreams in this space about eventually replacing the bathroom vanity with an antique buffet and vessel sinks, and a walk-in glass enclosed shower with double shower heads. I painted the guest bathroom about a year or so ago a very pale blue and even though it's a small space, I want to try to punch it up with a little more color. This is the bathroom with the missing sconces, and since that light is a similar finish to our master mirror light, I'm planning on using the same ceiling light for both. At my last outlet visit, I also bought that gorgeous West Elm mirror for $20 (originally $299) because several glass tile pieces had come out of one corner. I just replaced them with glass tiles from Hobby Lobby and some white putty, and it's almost as good as new. We're also planning to hang the extra long shower curtain higher in this room and have a recessed light eventually installed in the shower. In the future, I definitely plan to replace the brown vanity, gray sink and tall modern faucet. 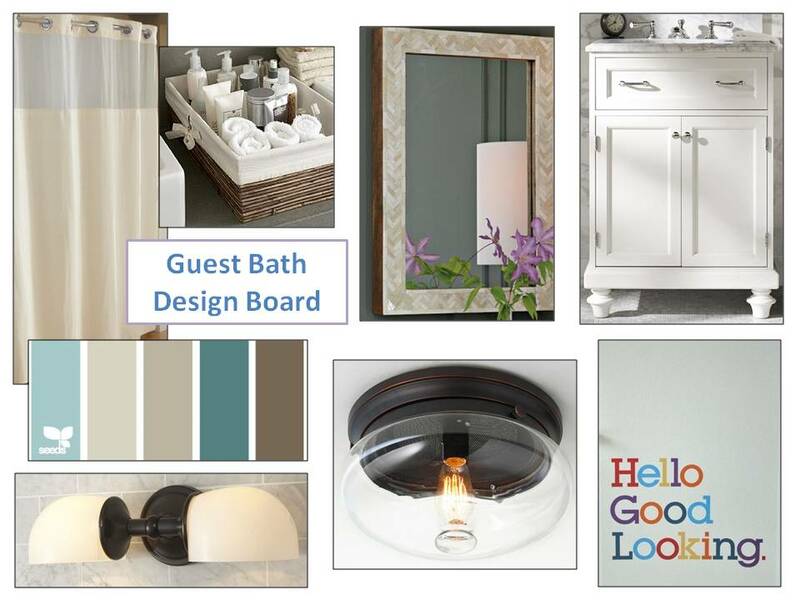 I am in love with that white vanity in the design board from Pottery Barn, but the price tag is definitely a bit high for us, so Keith and I have been brainstorming ideas for building/making our own. I'm loving the idea of turning an antique painted nightstand into a vanity or adding round feet to a store-bought cabinet for a more custom vanity look. Right now, we're counting every penny and having a lot more at-home date nights so we can bring out that contractor in the next few weeks to spiff up the sunroom. Until then, maybe I'll get those Shades of Light ceiling lights ordered and decide on a new color for the guest bathroom. I also promise some updated office pictures as soon as I get it organized!